Other Products:Brushed Corduroy, Peeled Paint, Victorian Velvet, Antique Linen & Scattered Straw Distress Inks, Coffee Archival Ink, Anna Griffen Poppy Embossing Folder, Ebosser, Spellbinders A2 Curved Borders One die, Spellbinders Majestic Elements Labels Twenty Five Die, White Cardstock, Rhinestones & Adhesive. Take a 5"x6" card base. 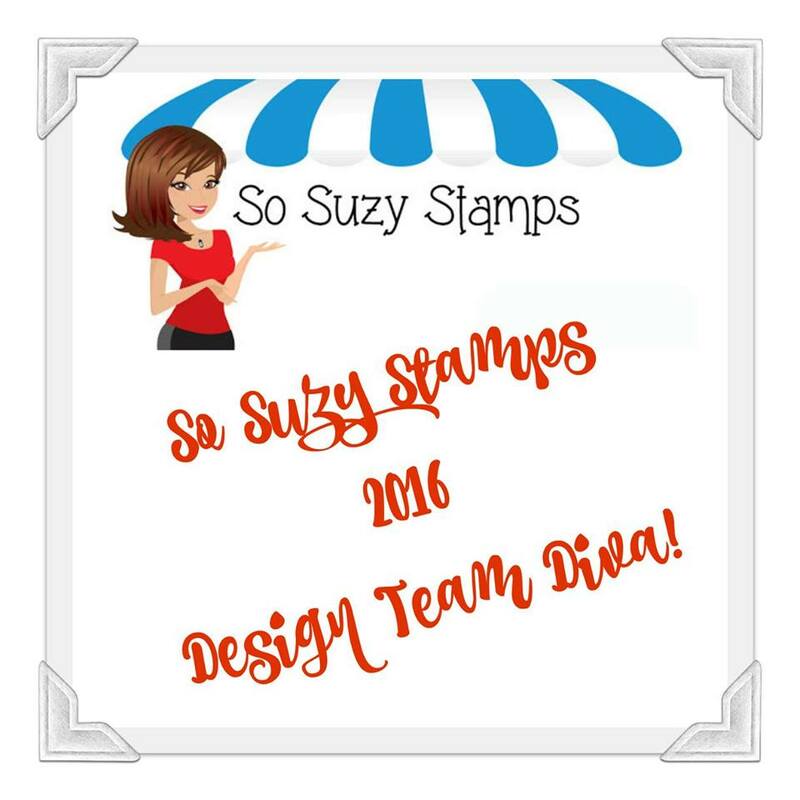 Take a piece of 4 3/4"x6" white cardstock, Emboss it with Anna Griffen Poppy Embossing Folder & ink lightly with Brushed Corduroy Distress Ink. 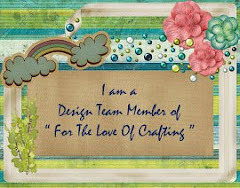 Adhere it to the card base leaving a 1/8" border on both sides. Die cut a tag with Spellbinders Majestic Elements Labels Twenty Five Die & stamp the sentiment from Heartfelt Expressions PreCut Set with Coffee Archival Ink. Adhere this iece in the middle of the card base. Take a piece of watercolor paper & stamp the small frower image from Botanical Rose Bouquet Cling Stamp Set several times with Brushed Corduroy Distress Ink. Keep rotating the image to a different angle while stamping to fill the page. color in the image with Brushed Corduroy, Peeled Paint, Victorian Velvet & Scattered Straw Distress Inks. Now Ink the whole cardstock with Antique Linen Distress Ink. Cut a 2" x 4 3/4" piece from this & cut it from the middle with a plain border die from Spellbinders A2 Curved Borders One die. 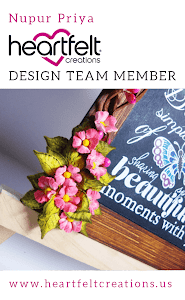 take 2 pieces of white cardstock & cut out 2 decorative borders using the same die set. Layer the colored pieces on top of the decorative edge pieces & adhere them on top & bottom of the card front with foam adhesive. Embellish with some rhinestones. Awesome creativity, Nupur!!! Swooning over this creation of urs...Simple yet SO very Striking effect!!! 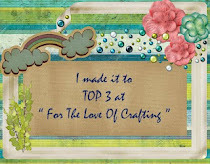 Love those die cuts Nupur!! Gorgeous card! Nupur, this is stunning. I love the background and how you used those die. Aww Nupur Di.. this is just soo awesome... one of ur best creations... love it! 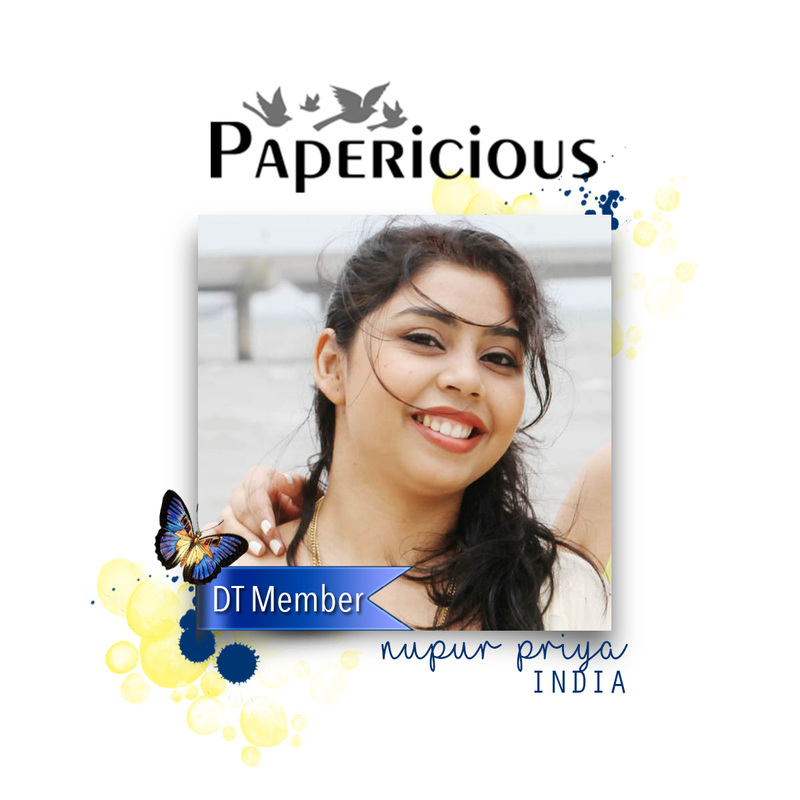 I'm so impressed with the background paper you designed, this is lovely Nupur!! You are soooooo talented! That background is stunning!!!!! Nupur, this is sooooo impressive! Your background paper is amazing! A very elegant card .